We take it for granted that the search for extraterrestrial intelligence (SETI) is a safe endeavor. 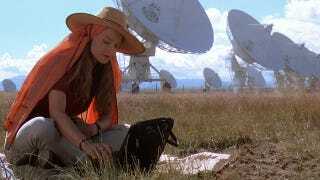 Seriously, what could possibly go wrong with passively searching for interstellar radio signals? Unfortunately, the answer is quite a lot –- especially if the incoming signal contains something malicious, like a computer virus or Trojan horse. And according to the experts, this isn't just idle speculation – the threat is very real. So, just how concerned do we need to be? To get a better sense of this possibility, we spoke to two experts on the matter: Andrew Siemion, a PhD candidate in astronomy at SETI-Berkeley, and Milan Cirkovic, Senior Research Associate at the Astronomical Observatory of Belgrade and a leading expert on SETI. We'll get to their answers in just a second, but it's worth doing a quick review to understand where this idea came from –- and not surprisingly, it's science fiction inspired by science. Science fiction writers have been worried about this possibility ever since the advent of SETI, back in the early 1960's. Soon after the launch of Frank Drake's Project Ozma in 1960, which was the pioneering attempt to listen for extraterrestrial radio signals, the BBC produced A for Andromeda, a television series that was written by the acclaimed cosmologist and science fiction writer Fred Hoyle. The story concerns a group of scientists who detect a radio signal from a distant galaxy that contains instructions for the design of an advanced computer. The scientists decide to go ahead and build the computer, which in turn produces a new set of instructions for the creation of a living organism, named Andromeda. It's at this point where one of the scientists raises an objection, amid fears that Andromeda's purpose is to subjugate humanity. In 1968, Stanislaw Lem reprised this issue in his novel His Master's Voice. In the story, scientists work to decode what seems to be a message from outer space, specifically a neutrino signal from the Canis Minor constellation. As the scientists decode the data, they conclude that it is a mathematical description of an object, possibly a molecule or even an entire genome. They go on to construct two strange substances that exhibit odd properties, a glutinous liquid and a solid object that looks like a slab of red meat. They learn that the liquid can cause an atomic blast at a remote location –- which, if used as a weapon, would make deterrence impossible. As a result, many of the scientists become convinced that it's an extraterrestrial weapon of some sort. And more recently, the idea of receiving instructions from aliens was explored by Carl Sagan in his 1985 novel Contact (which was made into a major motion picture in 1997). But unlike his worrywart sci-fi predecessors, Sagan portrayed aliens as being genuinely friendly. In Sagan's story, extraterrestrial contact is made, with the aliens transmitting the blueprints to a massive engineering project — supposedly for us to build. After much consideration, the device is constructed, and it turns out to be a transportation device for a single human occupant. Carl Sagan always held firmly to his belief in benign aliens. He was convinced that any advanced civilization had to be friendly by default — that overly aggressive or misguided aliens would have destroyed themselves prior to advancing to such a stage. His theory suggested that an interstellar selectional effect was happening, and the only advanced aliens left standing would be the good ones. Sagan's optimism notwithstanding, we should probably be more than a little bit wary of receiving a signal from a civilization that's radically more advanced than our own. When we spoke to SETI-Berkeley's Andrew Siemion, he admitted that SETI is aware of this particular risk, and that they've given the issue some thought. He stressed that SETI's primary objective is just to detect a signal. "Detecting signals is far easier than decoding them," he told io9. "Our searches don't attempt to decode or decipher any information content from signals that trigger our algorithms." In other words, the folks at SETI-Berkeley are only concerned with whether or not a signal is present, and whether it's real. But that doesn't mean they're still not careful. When we asked Siemion about the possibility of inadvertently receiving or downloading a virus, he stressed that the possibility is extraordinarily low, but not impossible. "Our instruments are connected to computers, and like any computers, they can be reprogrammed," he warned. "Our software receives input that ultimately comes from unknown sources, and again, while this input is never executed or decoded, we don't perform rigorous checks to validate this unknown input like a computer security conscious programmer might do with an internet application." Siemion speculated that, if an extraterrestrial intelligence had very deep knowledge of the software systems we use for our experiments and the architecture of our computers, they might be able to send a sequence of signals that would cause a memory buffer to overflow and perhaps allow arbitrary code execution. "However, if ET had this level of knowledge about terrestrial technology," he said, "it would make far more sense to use a similar technique with the thousands of satellite downlink stations dotting the globe, or the billions of cell phone radios constantly listening for a ping from a cellphone tower." Siemion stressed that this doesn't apply to such projects as SETI@Home and Astropulse, which he said are "thoroughly vetted by very competent computer security professionals, and every effort is made to ensure [their] safety." In regards to the threat of a Trojan horse, Siemion admitted the possibility, but doubted that humanity would ever blindly follow a set of blueprints or instructions that we received from another intelligent civilization. "Just as human cultures establish trust over many decades and centuries moving in small steps, humanities' relationship with an extraterrestrial civilization would likely evolve slowly over perhaps many millennia," he told io9. "Maybe after many thousands of years, when humanity has established some level of rapport with our cosmic neighbors, we might feel comfortable accepting and utilizing their technology." Like Siemion, Milan Cirkovic also believes that the risk of acquiring something nasty from an ETI is very real. But he's a bit more worried. Alien invaders won't attack us with their spaceships, he argues — instead, they'll come in the form of pieces of information. And they may be capable of infiltrating and damaging or subverting our computing networks, in a manner that's similar to the computer viruses we're all too familiar with. Cirkovic admits, however, that the possibility should be taken with a grain of salt. In order to work, an alien virus would have to somehow know or intuit our protocols and operating systems. "The efficiency of a virus in achieving its malicious task is proportional to the degree of its specialization. More general viruses are, therefore, less efficient," he tells io9. "To be able to infiltrate our networks, the alien virus should be general to a fantastic degree." When we asked Cirkovic what the purpose of an ET virus might be, he responded, "If we discard anthropocentric malice, it seems that the most probable response is that they have evolved autonomously in a network of an advanced civilization -– which may or may not persist to this day." If this is the case, speculated Cirkovic, these extraterrestrial viruses would probably just replicate themselves and subvert our resources to further transmit themselves across the Galaxy. In other words, the virus may or may not be under the control of any extraterrestrial civilization –- it could be an advanced AI that's out of control and replicating itself by taking over the broadcast capabilities of each civilization it touches. A very frightening thought. To prevent this, Cirkovic suggests that we should sever any connection between the SETI and METI (messages to ET) equipment, and the rest of the human info-sphere. He admits that this is easier said than done. Cirkovic's fear is not without warrant — after all, people write viruses here on Earth all the time, for no particular reason. Perhaps signals such as these are the ultimate manifestation of computer viruses — a self-replicating information system that finds compatibility with others, thereby infecting it. It's clear from our conversations with Siemion and Cirkovic that extraterrestrial life may be more bizarre and dangerous than we can imagine. Should humanity eventually receive a transmission from the depths of space, we would do well to treat it with great caution and consideration. Top image via x264-bb. Inset images via TechnoFile, Discovery.